ISBN 0-19-821737-4Reviewing a book that weighs in at more than 1200 pages and carrying it from office to home reminded me of that North American game of social responsibility in which teenagers are asked to carry around a bag of flour to simulate the reality of the responsibilities of having a child! Indeed, the reader has the strong sense that the editor and the board of editors of the New History series have seen this book come to fruition after a long and arduous labour stretching back to the 1970s. 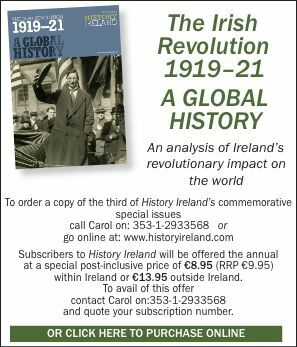 With 22 esteemed contributors, this is truly a major addition to our knowledge of the history of Ireland. Each of the chapters is an important piece of research and scholarship in its own right. But the focus in this review is the book as a whole, which on the dust-jacket is proclaimed as ‘the first truly comprehensive and authoritative account of Irish history from the dawn of time to 1169’. In that context it seems most appropriate to give a flavour of the book and its strengths and weaknesses. In terms of overall structure, introductory chapters on prehistoric and early Ireland, the geographical element in Irish history and the physical environment are followed by a period-based treatment of Irish prehistory (Ireland before 3000 BC, Neolithic Ireland, Bronze Age Ireland, Iron Age Ireland). For the period between AD 400 and 800 an overview is provided and then there are a number of treatments of different topics and themes (some of which cover the period to 1169): the archaeology of early medieval Ireland; the church in Irish society, 400–800; and early Irish law. Four chapters on Hiberno-Latin literature to 1169, the early history of the Irish language, language and literature to 1169, and manuscripts and palaeography form a distinct, linked set. The impact of the Vikings from the 790s is seen as a turning-point, signified by a chapter giving a pen picture of Ireland around 800. This is followed by considerations of the Viking Age, the Irish church 800–1050, church and politics 750–1100, visual arts and society, ecclesiastical architecture before 1169, music in prehistoric and medieval Ireland, the archaeology of Ireland’s Viking Age towns, and coins and coinage in pre-Norman Ireland. As the editor of this volume, Dáibhí Ó Cróinín, has written in his own book on early medieval Ireland, the eleventh and twelfth centuries are the period in which the development of a more powerful kingship played a key role in political events. This is reflected in the structure of the volume, with chapters on Ireland before the Battle of Clontarf, Ireland and her neighbours 1014–72, and high-kings with opposition 1072–66. The final chapter covers Latin learning and literature in Ireland, 1169–1500. My own background as an archaeologist, and more particularly as a prehistorian, inevitably influences the way I approach the book as a reader. A striking point in that regard, which is referred to by a number of the contributors but not really questioned, is the centrality of the written word to accounts of early historic Ireland in contrast to prehistory, where the archaeological record takes centre stage. The idea of the written word as the primary source of evidence is a key linking perspective in many of the chapters. On the very first page Thomas Charles-Edwards makes the point that since the coming of Christianity Ireland has been shaped by communities with a reverence for and understanding of the Bible. Hence, it is perhaps not surprising that words are often assumed to be the best approximation we have for understanding the past. How these kind of implicit perspectives can become a value judgement influencing approaches to interpreting history is seen in the comment by Francis J. Byrne (p. 620), when comparing Irish and Scandinavian societies in the ninth and early tenth centuries, that the standard of culture had been raised by the introduction of Christianity to Ireland in the fifth century. But on the other hand Byrne recognises the role that archaeology has played in changing views on the Viking Age, a point clearly illustrated in Patrick Wallace’s chapter on the Viking Age towns. Nobody would deny the central significance of the written word as a source for early Ireland. Furthermore, many of the contributors demonstrate a subtle appreciation of the complexity of the written record, for example in discussing how a fictitious and mythic view of Irish history was promulgated in early historic Ireland that reconciled, as James Carney puts it (p. 460), the origins of the Irish (through a series of invasions) with the Book of Genesis. But in general the volume appears to be organised on the premise that all the other strands of evidence, particularly the material evidence surviving from the period, in some way support the historical narrative rather than making a fundamental contribution to how we can approach this, or indeed any, historical period. One could argue, for instance, that the material wealth seen in the archaeological evidence discussed by Nancy Edwards not only reflects the position of royal families and their kin but was very actively involved in the plays for power and position in Ireland in the period 400–800, as discussed by Dáibhí Ó Croinín. This question of how we render the complexity of life is perhaps most directly addressed by Ann Buckley in her chapter (pp 766–7), where she talks about the difficulty of translating three-dimensional objects and figures into two-dimensional representations. While in this case Buckley is discussing the problem of interpreting depictions of musical instruments on high crosses, she raises a broader issue that needs appraisal. There is striking contrast in the volume between the linear, chronological treatment of Irish prehistory and the much more discursive approach to early historic Ireland. Not surprisingly, in the range of contributions on the latter period there is a degree of overlap and also a recognition of major themes in early historic life. These include the respect for and reworking of the past, the significance of the church in early Ireland, the interplay between oral and written traditions of learning and writing, the relationship between Irish and Latin, and the social and political dynamism of the period, with a number of key times of change which put society on a different trajectory. In this context it is interesting to consider the end of the period with the coming of the Anglo-Normans as being precipitated by the rise in royal authority over the eleventh and twelfth centuries, as discussed by Marie Therese Flanagan. It was Diarmait Mac Murchada’s reaction to the loss of his kingship of Leinster and his desire to recover that kingship and to make a bid for the high-kingship that led him to appeal to Henry II for aid and ultimately brought the arrival of the Normans. In line with what has been said above, the strength of the book lies in the quality of the individual chapters. While several authors quite rightly comment on the difficulties of dealing with the sources for early historic Ireland, the reader is provided with subtle, nuanced and critical discussions of different aspects of life and society in early Ireland. Given the range of authors involved, there are inevitably differences of opinion and emphasis. It is interesting to compare the portrayals of the character of the early church given in the first chapter by Hughes, the chapter by Byrne on the church and politics and the two chapters by Richardson and Stalley on the art and architecture of the church. Despite this detailed coverage of early Ireland there are some interesting gaps; for example, the only time that Early Christian burial is treated in any detail is by Ó Corráin in his discussion of Ireland around 800, when it is used to provide some detail about the living population. This is an area where we have considerable evidence that might have informed discussion in a number of ways, for example on the question of how the transition to Christianity occurred and the degree of continuity with existing practices and places. Having given a brief, personal comment on some of the issues that arise from considering the book in terms of individual chapters, it seems appropriate to say something more generally about the organisation and structure of the volume as a whole. In terms of the stated aim of the volume to provide an authoritative and coherent account, it would have to be said that the order in which some of the chapters are presented seems inconsistent. For example, it would seem logical that the chapter on the physical environment by Haughton would have preceded rather than followed that on the treatment by Andrews of the geographical element in Irish history. The chapter by William O’Sullivan on manuscripts and palaeography could have usefully informed readers before they got stuck into the four chapters on related topics that come before O’Sullivan’s chapter in the book. Much more critical, however, is the length of time that the volume has been in preparation. Some of the papers were written in the 1970s, with additions and revisions in the 1980s, while others are more recent in date. Now in terms of the volume as a reference work this problem has been addressed in the bibliography, where strenuous efforts have been made to bring it up to date to the end of the year 2000. But the basic problem is that key chapters in the book are out of date. This is made a virtue of in the preface, where it is stated, for example, that the chapters by Carney, Hughes and O’Kelly are of lasting value, largely requiring only annotation to take account of work since their death. Here I wish to restrict my comments to the period I know best, i.e. prehistory. The three chapters by M.J. O’Kelly reflect the state of knowledge when they were written, in the 1970s. But archaeological knowledge, and in some cases the research framework itself, has changed dramatically over the last 30 years. As one example, it is clear that rather than early Bronze Age burials taking the form of single, isolated burials, as was the accepted view when O’Kelly was writing (p. 105), in most cases they occur in cemetery contexts. The dating framework used in these chapters would not be considered appropriate today. Hence these chapters cannot be seen as a comprehensive and authoritative account in 2005 of Irish prehistory before the Iron Age. This does not detract from the historical value of these chapters but they cannot be said in any way to reflect the vigorous growth in scholarship in the discipline since the beginning of the 1990s. In a volume such as this that will quite rightly attract general as well as specialist readers it would have been appropriate to provide a much clearer indication to the reader of when each chapter was written and revised. This would have made it much easier for the reader to evaluate those areas in which this volume of the New History is truly comprehensive and authoritative. This book will be an essential source on early Ireland, but in reality the prohibitive cost will mean that most people will consult it in a library rather than having it to hand. For the general reader it might also be profitably read alongside up-to-date texts on the different periods and themes covered. This would provide the background and context for appreciating the wealth of ideas and scholarship it contains.